This outfit is super cute! I would recommend washing the pettiskirt before wearing to take the stiffness out. Also, order a size bigger than you normally buy. It seems to run on the small side. Don't Iron on the Initial! Overall the costume looks as pictured, although I found it runs slightly large. It comes with a plastic bag of letters and instructions to sew on an initial, which I though was a cute touch. That said, even at my irons lowest setting, it burned a hole through the costume only hours before the 50's dance. That was a huge disappointment and I don't recommend that you even use the initials. The belt appears to be a one size item, and was impossible to wear on a small frame. My daughter liked it but did not like the petticoat she said it was to itchy. 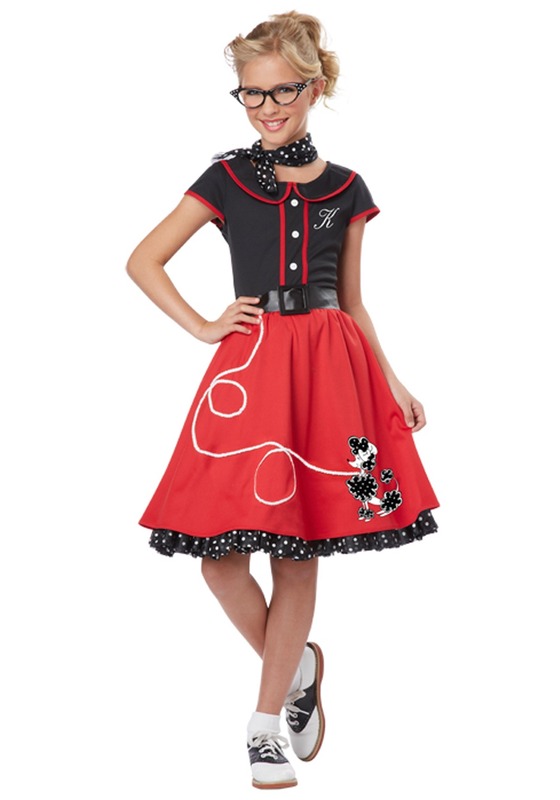 Needed this in a hurry for a school sock hop! True to size. Large is a 10-12. Petticoat fabric was on the itchy side. But overall very cute costume.